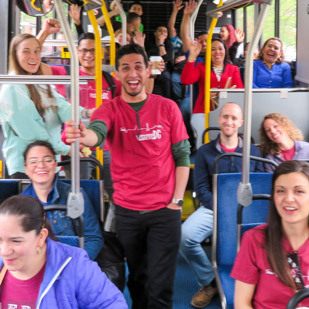 “I’ve never been to the National Mall before,” said Juan as he sat on the Metro heading towards the Smithsonian. “Now that I know how to ride the Metro, this will be easier to come by myself,” his friend Pedro declared. Soon they would both be experiencing the National Mall for the first time in their lives. They were among the sixteen students from Casa Chirilagua’s Yo Hablo Inglés English Language Learning program to take a field trip to DC. Soon they would be seeing the sites and practicing their English through a scavenger hunt. Volunteers from Restoration City Church accompanied their peers to support each student with their English skills. Afterwards, the students enjoyed a sunny picnic in front of the National Monument. 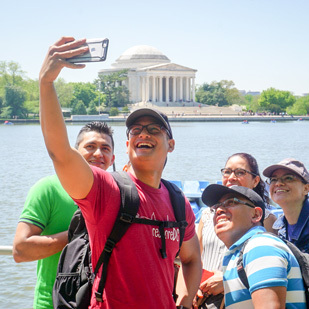 Reflecting on this visit, Maria noted that, “It was great to come on my own without my kids to explore and really enjoy the sites.” This was particularly true for students who work in the city but have never had the opportunity to enjoy the museums and National Mall. A team of volunteers provided childcare back at Casa’s community center so that parents could enjoy this trip with their classmates. Their final stop was the Jefferson Memorial. As they walked the Tidal Basin students were amazed by the surrounding trees and enjoyed the refreshing walk along the waterfront. “It’s beautiful!” said Adriana as she saw the impressive marble monument in the distance. “I love the tour!” Jose agreed. He was very excited as the group walked to the monument before the group returned to the Metro.